More than four months have passed since the first votes were cast in general assemblies across Québec that initiated the student strike against tuition increases. Since its onset, the unlimited general strike has emerged into a pillar among others within an international student movement that is currently resisting neoliberal austerity measures and the privatization of public commons synonymous with extreme capitalism. 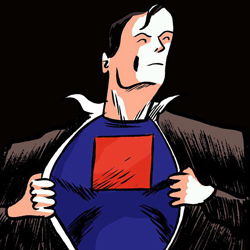 “The red square incites violence. It must be true. Now I’m stopped in the street to be brutalised.” by Kew 2012. Red felt squares pinned to pieces of clothing are now part of Montréal’s moving landscape. They resurfaced as remnants of the 2005 student strike that successfully stopped the government’s proposed transfer of $103 million from the bursaries program into loans. As striking students, we have traded classroom theory for street practice to fight against the government’s “debt sentence” that would leave students squarely in the red. “Our 50 anti-pepper spray products as sellected by 1625 readers. Politics: vote without dad’s interference. Dossier: My boyfriend studies at Nicolet (police academy). Testimony: Her boyfriend looses his eyesight. Fashion: Be ready for back-to-school. Comment: Avoid the batons. Blogs: Making love after the demonstrations. 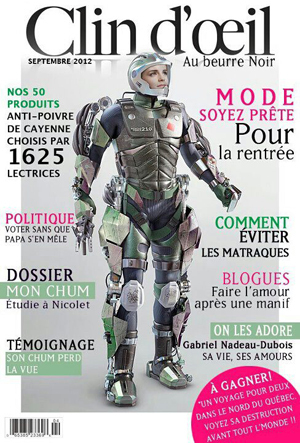 We love them: Gabriel Nadeau-Dubois (spokesperson for La CLASSE) His life, his loves. To Win: a Trip for two to northern Québec. 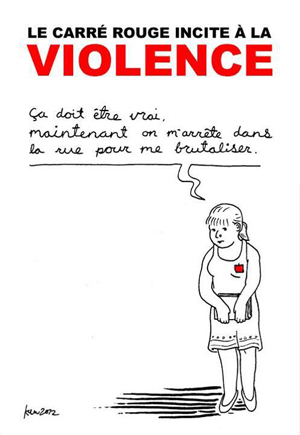 Vieux its destruction before everyone else.” Artist unknown. The casserole and the wooden spoon became dissentient symbols in response to repressive Bill 78. This anti-democratic law gives special powers to individual ministers and threatens students rights to association, among other draconian measures. The bill has encouraged a wider segment of the population to actively support the student movement. Borrowed from the 2001 cacerolazos demonstrations in Argentina and inspired by the 1973 cacerolazos in Chile, neighbourhoods have decentralized the protests and brought mobility beyond Québec’s urban centres. As students, the solidarity helped us feel less isolated. The audible cling, clanging of an approaching casserole protest, drew others into their ranks, adding to the cacophony and empowering the ‘illegal’ assembly. Now each time a neighbour taps a spoon on the edge of a pot after stirring an afternoon meal, I momentarily become a cacerolazos. These household items have democratized resistance and given everyone the opportunity to share their malaise with others in public. Beyond these two seminal representations of current dissent in Québec, the strike’s short four-month history has its shared moments, its collective benchmarks: The first family demo on March 18 with its estimated 30,000 demonstrators showed for the first time that we, as striking students, had a support base beyond the student movement. Four days later, the 200,000-strong ‘manifestation nationale’ converged striking students and our supporters from all over Québec, confirming that the movement was not a marginal one, despite government rhetoric. The most common shared experience is the overwhelming police presence and often gratuitous police violence that has degraded the public discourse surrounding the strike. It has left us more distrustful of power and unveiled its abuses. 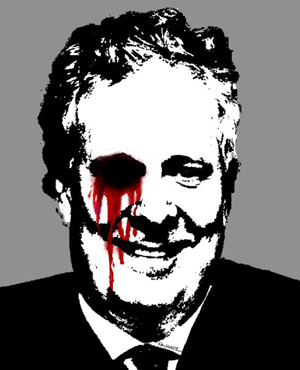 Image of injured Jean Charest. Artist unknown. 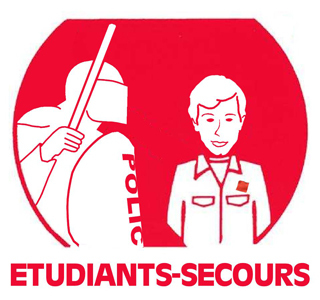 On April 20 at the Salon Plan Nord, Premier Jean Charest joked to his business buddies at the expense of student protestors while we were outside being teargassed and shot at with plastic bullets. Later, student representatives cancelled upcoming negotiations after Then-Education Ministre, Line Beauchamp denied access to the talks for one student association unless its spokesperson publicly denounced student violence. He would not comply because his membership makes a distinction between violence inflicted on people and the ‘so-called’ violent act of breaking a bank’s window, which the government abhors. The students unions closed ranks and collectively withdrew from the negotiations. Ask any student protestor and we will tell you that violence on the streets usually begins with charging battalions of riot police, batons wielded, occasionally preceded by sound grenade volleys that explode slightly overhead, close enough to get shrapnel in the eye. This was confirmed on March 7 when one student lost the use of his right eye while protesting in front of the Loto-Québec building. The use of sound grenades for crowd dispersal continues. 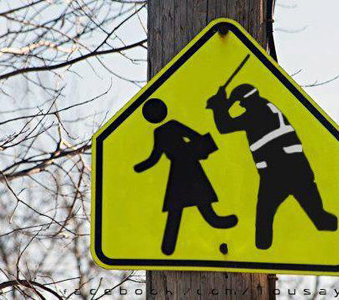 “Against tuition increases. Mobilizations. Demonstrations. Occupations. Blockages. General Strike. 1778 dollars later. their days are numbered.” by Moïse Marcoux-Chabot. Another benchmark is the protest at the Liberal convention in Victoriaville that saw a sharp rise in police violence, downgrading the tone of the strike by several notches with 102 arrests. Twelve people were injured including one student who lost the use of his left eye. Another lost several teeth after being hit in the face by a rubber bullet. Then-Education Minister Line Beauchamp surprised everyone with her resignation days later, claiming to be making the ultimate sacrifice by leaving public office after being unable to resolve the conflict. Others believe that she was unwilling to carry Bill 78 forward, since it was discovered that a draft was being written prior to the failed negotiations, and possibly weeks before its introduction on May 16. 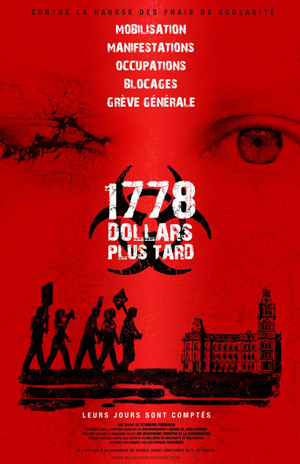 The eight days following the introduction of the new Bill, protests in Montréal, Québec City and Sherbrooke were severely repressed resulting in a total of 1366 arrests. The City of Montréal passed an anti-mask bylaw further demonizing students for protecting themselves from the overzealous use of pepper spray and their right to privacy. The neighbourhood casserole marches were a direct reaction. The tourist season started with the Grand Prix weekend, which was targeted by students for its international reach. Youth and anyone with a red square were politically profiled by police and dozens of people were arrested for “preventative” measures. 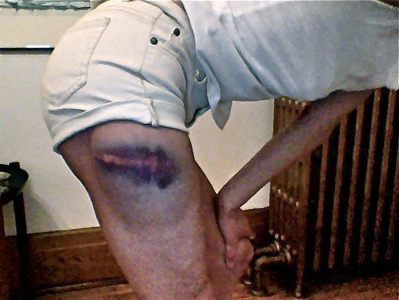 Serious leg contusion at the hands of Montréal police. photographer unknown. Amid these benchmarks are personal elements of lesser significance that lack newsworthiness like minor protest-related injuries: deep purple contusions from rubber bullets or blows from swinging batons; scraped arms and legs after being shoved to the pavement by a running riot police behind his shield; bruised or fractured ribs from deliberate jabs with a baton for not retreating fast enough; stinging eyes and bloody noses that linger days after being pepper sprayed in the face at close range. These have gone unreported maybe because they are subtle and have become commonplace. They are shared within student discourse through imagery that gets passed around social media to reinforce the bonds of solidarity. 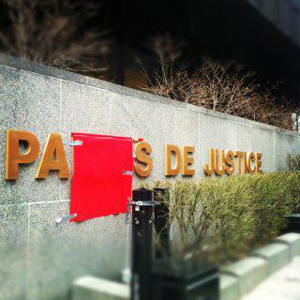 “No Justice.” A red square blocks out ‘lai’ in ‘Palais de Justice’ (courthouse). Artist and photographer unknown. Posters and other imagery like the ones here are widely produced and shared via social networks to feed an insatiable online dialogue. Our creativity has become a ritual of affirmation, an opportunity for self-reflection and critical analysis that allows us to continue forward through the mire of political wrangling. The popular imagery offers a unique narrative of our current social upheaval. It is being archived and simultaneously shared so that it may be recycled back into the movement to fuel creative inspiration. “Police partout, justice nulle part” (Police everywhere, justice nowhere) is a regular slogan chanted to riot police who often flank both sides of the nightly demonstrations. As a variation of Sven Lindqvist “dig where you stand”(1) idea that “workers should investigate their own workplaces” to provide an alternative history of business that focusses on workers’ experience rather than on markets, social movements must dig where they march. I have begun digging through the landscape of the student strike and have amassed a collection of more than 1000 image artifacts that is creating an ongoing autobiographical narrative of a political movement filled with a nuance unavailable elsewhere. I’ve included only a few images that address police violence, as a sample. 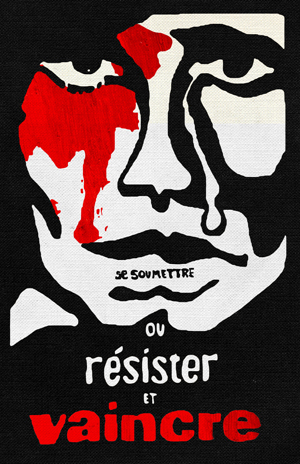 “To submit or resist and vanquish.” by Moïse Marcoux-Chabot based on Mai68 poster. This article was originally published within the special open-wi issue of wi: journal of mobile media Spring 2012, vol. ii.